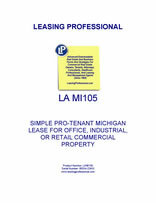 This form is for a single tenant Michigan lease where the tenant has superior leverage. It gives the tenant the right to use the premises for "any legal use," and has very abbreviated remedies for the landlord in the event of a tenant default. It is also pro-tenant in character because of the clauses it does not contain which customarily appear in pro-landlord forms relating to remedies and a variety of other pro-landlord provisions. Michigan is home to Detroit, the world’s “Motor City.” Michigan is also home to almost ten million people and most of its border is coastline: Michigan lies to the east of Lake Michigan, the south of Lake Superior and the west of Lakes Huron and Erie. As well as car manufacturing, the state specializes in farming, timber and fishing.